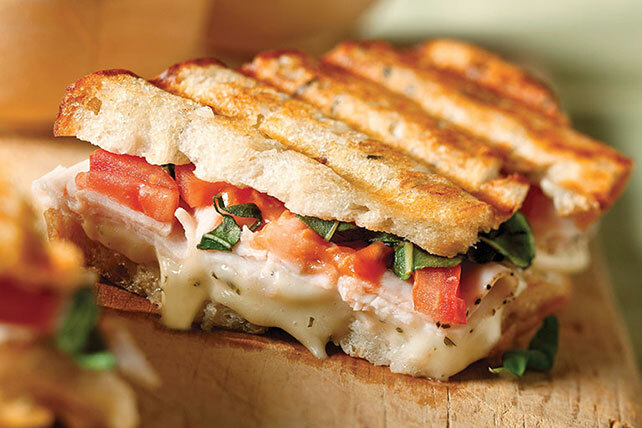 Fill bread slices with turkey, cheese, basil and tomatoes. Grill 3 min. or until golden brown. Heat skillet on medium heat. Cook sandwich 5 min. on each side or until cheese is melted and sandwich is golden brown on both sides, gently pressing down top of sandwich with a spatula to flatten slightly as it cooks. Substitute 2 tsp. KRAFT Tuscan House Italian Dressing for the mayo. Prepare using 2 oz. OSCAR MAYER CARVING BOARD Oven Roasted Turkey Breast. If packing for a brown-bag lunch, spread mayo on inside of sandwich and serve cold.